Buying or Selling — What Should Happen First? There are benefits to both scenarios. Understanding the factors that are involved in each will guide you to make the right decision for your particular situation. Finances, the real estate market, and even personalities are factors in which to consider when trying to determine if you should buy or sell first. Both scenarios have pros and cons worth considering which we’ll look at below. If you choose to sell your existing home first, the number one benefit will be having a down payment for your new home. Having this down payment will give you the peace of mind of knowing exactly how much you have to spend on your new home. There have been many cases in which a person bought a new home prior to selling their existing home, and overestimated how much they would make when their first home sold. If you made the decision to sell first, chances are you have already been looking for a new home. You might have even found one that you love and you will be able to make an offer as soon as yours sells. On the flip side of this scenario, selling your home first could lead to having to move twice, which can cause greater emotional and financial unrest. If you sell your home without having another home to move into, you’ll need a plan to determine where you will live and where to store your belongings. You might be lucky enough to be able to stay with friends or relatives while you go through the process of finding and purchasing a new home. While this would be a savings financially, it could certainly be emotionally taxing. If that is not an option you wish to explore, perhaps you would have to rent somewhere short-term. What if you buy first? What are the benefits? If you are financially able to purchase a second home before selling your existing home, you have the ability to take your time moving in and, most importantly to some, you only have to move once. No need to find a rental that allows short-term or month-to-month terms and no need to move your family in with relatives. Also, you won’t have the added to pressure to quickly purchase a home that you might not have chosen otherwise. Though you might not feel the pressure to choose a new home quickly, buying first could add the pressure of selling quickly. Keeping up with two mortgages can quickly become a financial burden, which can then lead to the necessity of selling your home to the first bidder whereas you might have been able to bank more money if you were able to wait a bit longer. One of the biggest drawbacks to buying first is financing. 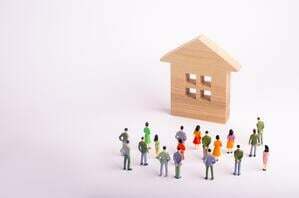 It may be very difficult to secure a loan on a second home unless you have cash on hand to show the lender. There are options available to help make buying first a possibility, and you should discuss these with your agent and lender. One option is adding a contingency to the contract. This would allow you to make an offer on a home but also allow you a pre-determined amount of time to sell your home in order to secure the financing. In a seller’s market, your offer with said contingency may not be accepted since the seller will often have more offers from people who have the funds readily available. Another option that is worth speaking to your lender about is a bridge loan or a HELOC (home equity line of credit). Keep in mind these are short-term solutions to help assist in purchasing your second home prior to selling your existing home. For many, deciding whether to buy or sell first might be an easy decision once you feel adequately informed about your options and the various consequences of each. Whatever your feelings on this are, be sure to speak to an agent and lender to get a full understanding of what options you have available to you. Study the market. Is it a buyer’s market or a seller’s market? Is there a chance you will be stuck with two mortgages for an unforeseen amount of time? Have a good understanding of what you can afford and what you qualify for by speaking to a lender.